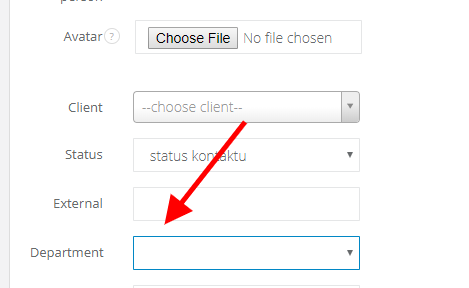 If you use Sugester's departments and you use this way to give your employees an access, remember to put clients' contacts to the right departments. For example, if your employee is assign to 'Customer service' department and handles clients from this department only, and client's contacts won't have any departments, then your employee will not see any emails from a client, even though he/she is from his/her department. Note! If your employees have access to clients from their own departments only, clients' contacts also have to be assign to the same department as the client. If you're adding a new client to a department, and then you add a contact to this client, the system will automatically assign the contact to the same department as client's. You can say that a contact will inherit client's department. In this case, you won't be able to change contact's department, the field will be gray. Same thing happens when you try to change contact's department in a client, who is not assign to any department. In this case you will also see a gray Department field, but this one will be empty. If a client is not assign to any department, then client's contact also doesn't have any department.